Professor Aldo R. Boccaccini has been listed in the prestigious Highly Cited Researchers 2018 list, published by Clarivate Analytics. The list contains the world’s most influential researchers across 21 scientific disciplines. The 2018 list includes 6000 researchers list recognizing world-class researchers selected for their exceptional research performance, demonstrated by production of multiple highly cited papers that rank in the top 1% by citations for field and year in Web of Science. Worldwide 208 researchers are included in the materials science category. Prof. Dr.-Ing. habil. Aldo R. Boccaccini is Professor of Biomaterials and Head of the Institute of Biomaterials at the Department of Materials Science and Engineering, University of Erlangen-Nuremberg, Germany.Prior to this appointment, he was Professor of Materials Science and Engineering at Imperial College London, UK (2000-2009). He has remained Visiting Professor of Materials at Imperial College London. He is also visiting professor at RWTH Aachen University (Germany) and Universidad Nacional de Cuyo (Argentina). Boccaccini holds a MEng degree from Instituto Balseiro (Argentina), PhD (Dr-Ing.) from RWTH Aachen University (Germany) and Habilitation from Ilmenau University of Technology (Germany). Before joining Imperial College in 2000, he had appointments at the University of Birmingham (UK), the University of California at San Diego (USA) and the Ilmenau University of Technology, Germany. The research activities of Prof. Boccaccini are in the broad area of glasses, ceramics and polymer/glass composites for biomedical, functional and/or structural applications. Prof. Boccaccini has also developed the electrophoretic deposition technique for production of nanostructured materials and composites with defined surface topography with potential use in the biomedical field. He is the author or co-author of more than 800 scientific papers and 15 book chapters. Boccaccini is Fellow of the Institute of Materials, Minerals and Mining (UK), the American Ceramic Society and the Society of Glass Technology (UK). He is the Editor-in-Chief of the journal “Materials Letters” (Elsevier) and serves in the editorial board of several recognized international journals including Journal of Materials Science, J. Tissue Engineering and Regenerative Medicine, International Materials Review, Plos One, Scientific Reports, J. Biomaterials Applications, Advanced Engineering Materials, Advances in Applied Ceramics, and J. Mater. Processing Technology. He is the founding editor and first Editor-in-Chief of the Open Access journal “Biomedical Glasses”. He has been a visiting professor at different universities around the world, including Japan, Italy, Singapore, Germany, Argentina, France and Poland. Boccaccini has been member of the organizing committee of numerous international conferences and he is the founder of the International Conferences Series on Electrophoretic Deposition (sponsored by Engineering Conferences International) having served as the Chairman of the 6 conferences of the series held so far in Canada (2002), Italy (2005), Japan (2008), Mexico (2011), Austria (2014), South Korea (2017). Review Paper Award, Ceramic Society of Japan, 2000. Verulam Medal and Prize in recognition of distinguished contributions to ceramics, Institute of Materials, Minerals and Mining, London (UK), 2003. Elected Fellow of the Institute of Materials, Minerals and Mining (UK), 2004. Member, EPSRC Peer Review College, UK, since 2003. Member of the European Continental Council of the Tissue Engineering and Regenerative Medicine International Society (TERMIS), 2005-2010. 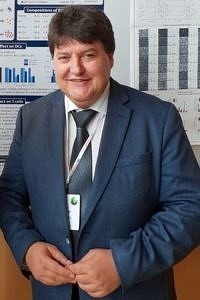 Member of two Technical Committees of the International Commission on Glass (ICG): Glass for Medicine and Biotechnology (since 2004) and Vitrification of Radioactive and Hazardous Waste (since 2006). Rector’s Award for Excellence in Research, Imperial College London, 2007. Co-Chairman, EUROMAT 2009 conference, Glasgow, UK. Member of the Executive Board of “Medical Valley European Metropolitan Region Nuremberg e.V.”, since 2010. Representative of Germany to the Management Committee of COST action MP1005, since 2011. Chairman, Annual Conference of the German Society of Biomaterials (DGBM), 2013. Fall Lecture 2013 at the Institute of Ceramics and Glass of Madrid, Spain, 2013. „Materials Best Paper Award 2014-Category Reviews“, journal Materials, 2014. 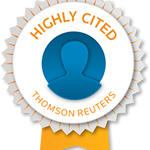 Highly cited researcher listed in “2014 Thomson Reuters Highly Cited Researcher” and included in Thomson Reuters’ report: „2014 The World’s Most Influential Scientific Minds“. Chairman, 6th International Workshop on Advanced Ceramics, Erlangen, Germany, 28-30 September 2014. Co-Chair, International Conference on Geopolymers, Hernstein, Austria, May 24-29, 2015. 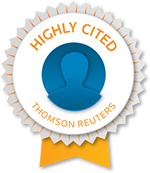 Cited Researchers list is available in the website of Thomson-Reuters.